2011, Universal Pictures. Directed by Tim Hill. Running time: 90 minutes. PG. Starring: James Marsden, Russell Brand. Helm: Why did you take me to this film? I understand that it may have appealed to you because it is a film aimed at children and you are a sniveling child, but why did you bring me? Mathew: Well, because it's got the Easter Bunny in it. Mathew: And I thought it would be fun for you because, you know, you can relate to it. Helm: I related to it as 90 minutes of boring agony. Were you imagining the relationship would take some other form? Mathew: Well... You're kind of like the Easter Bunny, so I thought you'd like the movie. Helm: I am like the Easter Bunny? Mathew: You know, the Easter Bunny is a mythical creature and you're a mythical helmet. Duh. Helm: I do not believe that you properly understand the definition of the word mythical. Mathew: Sure I do. It means, like... you know, magical and originating in the mist shrouded legends of the elder days and stuff. Helm: No it does not. It means without foundation in fact; imaginary; fictitious. The Easter Bunny is mythical. I am a reality. Mathew: Yeah, yeah. Blah blah blah. Got it. But what did you think of the movie? Helm: It was nearly as infuriating, incoherent and thoughtless as you are. Mathew: So... you didn't like it then? 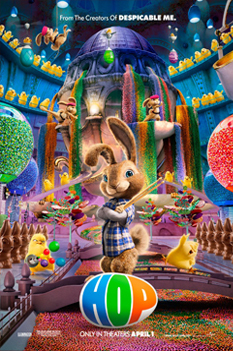 Mathew: Not even the part where the rabbit poops jelly beans? Mathew: Not even the part with David Hasselhoff? Mathew: Okay, fine. You don't have to yell. Helm: Two flaming swords? Are you daft. Mathew: I liked when he pooped the jelly beans and I thought David Hasselhoff was funny. Helm: But the plotting and story development were so sloppy! Mathew: The bunny pooped jelly beans and then that one chick ate them. That's worth something in my book. And the little kids in the audience seemed to like it.